I grew up in a Navy family that traveled to new tours of duty every couple of years. Many of those stations required transportation in propeller powered military aircraft. So my fascination for flight began at an early age. I always wanted the window seat. As a nine year old, I distinctly remember flying across the Pacific Ocean to the island of Guam. How I loved peering out of the window at the ocean and islands below! Today I still hold that same fascination for flight with aerial photography. 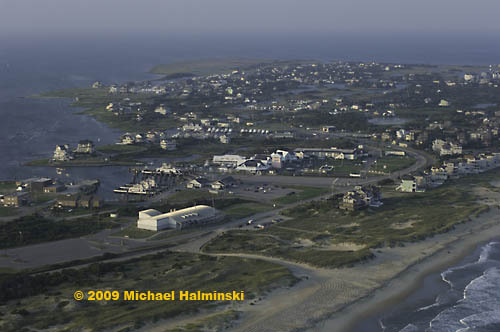 After Hurricane Isabel in 2003, I made seven flights over Hatteras, Ocracoke and Portsmouth Islands. I wasn’t interested in the destructive power of the storm. 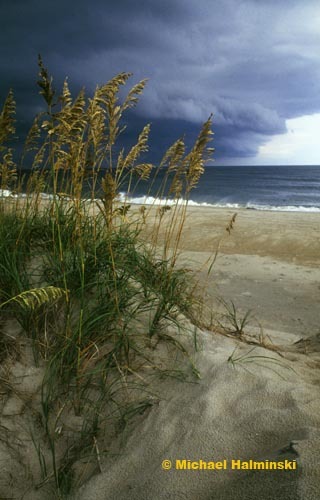 Instead I wanted to see and document how nature constantly shapes the Outer Banks. 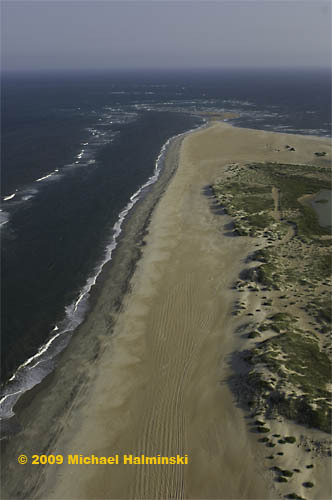 Last year, parts of the beaches of our National Seashore Park were closed due to bird nesting, including the Cape Point of Hatteras Island. 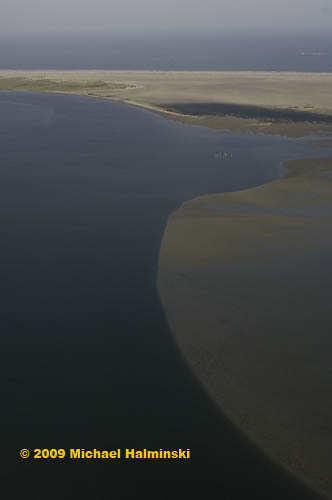 I’ve photographed the Point from the air before, but only with off-road vehicles on it. My intention last Summer was to fly and shoot it’s more natural, pristine state, but I procrastinated and suddenly the point was opened to traffic and I missed my chance. 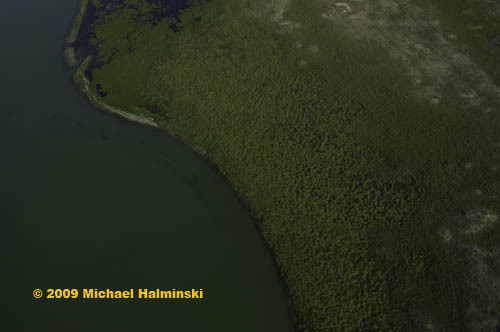 This year I put it off again until July 26th when I called my good friend and pilot Dwight Burrus. Dwight and his wife Debbie operate Burrus Flying Service out of Billy Mitchell Airport in Frisco. I’ve flown in his beautiful red and white 1971 Cessna on numerous occasions, and I can’t say enough about his expertise. I tell him what I’m looking for and he takes me there, every time. It’s almost as if I’m flying the plane myself. 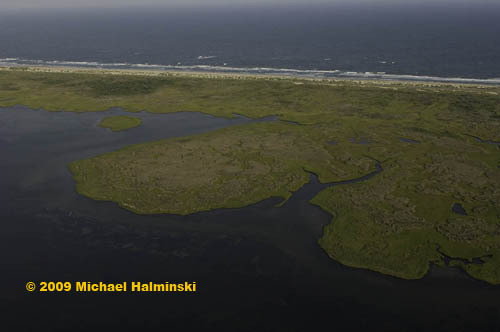 Dwight was raised on Hatteras, and knows the coast and it’s steeped history well. I highly recommend the tours of Burrus Flying Service. Call them at (252) 986-2679 or visit the web site for more information. Tell them I sent you. Let me show you what I saw on this latest flight, looking down on the scenery below. Looking out to Cape Point from the south or “the hook” side. Looking toward the point from the north beach. 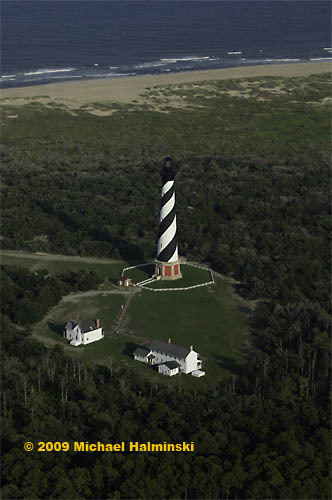 Looking toward the Cape Hatteras Lighthouse from over the Point. The shoreline of the pond at Cape Point. No flight is complete without a lighthouse fly-by. 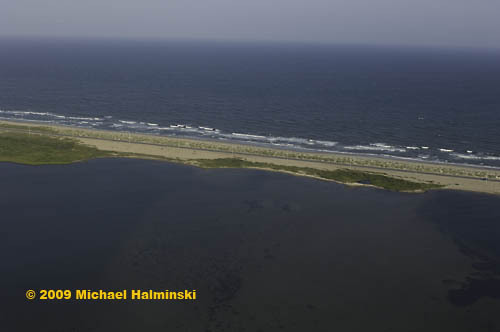 This is the site of the inlet that was cut by Hurricane Isabel. 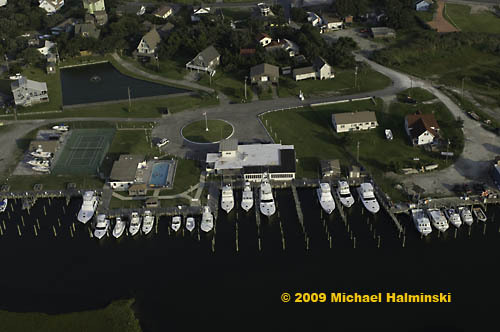 The famous Hatteras Marlin Club in Hatteras Village. The south end of Hatteras Village at the ferry terminal to Ocracoke Island. 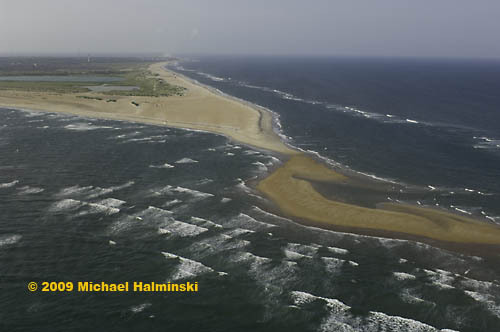 The south point of Hatteras Island at Hatteras Inlet looking to Pamlico Sound. 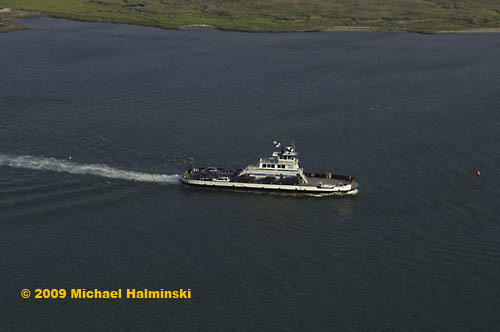 The ferry, Chicamacomico, en route to Ocracoke from Hatteras. 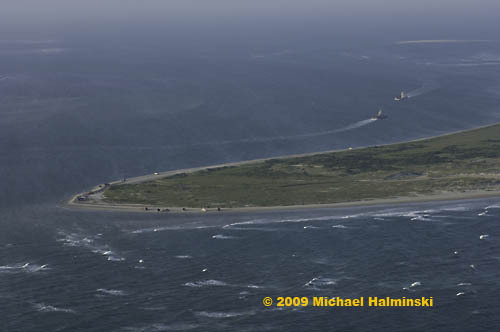 The north end of Ocracoke Island at the site of the former Hatteras Inlet Coast Guard Station. The station was destroyed in storms. All that remains are the pilings. 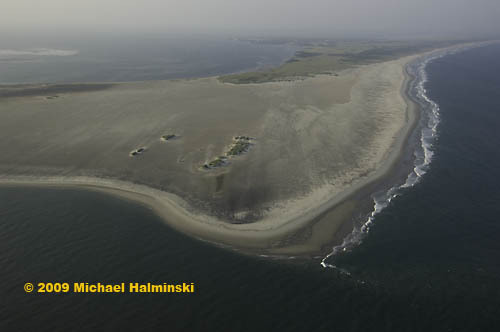 This illustrates the lack of stability of barrier island systems. Ocracoke Island from the sound side. 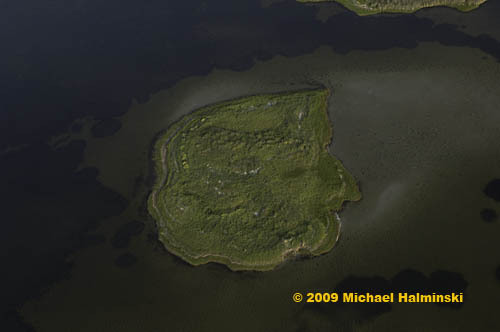 An island in the sound behind Ocracoke Island. 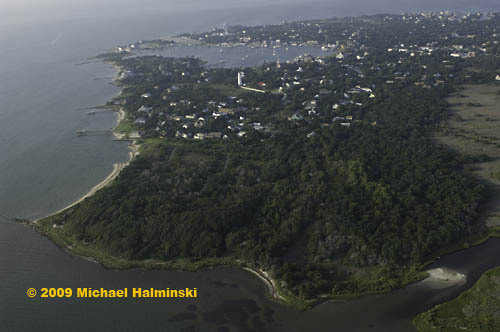 Silver Lake surrounded by scenic Ocracoke Village. The beautiful maritime forest at Springer’s Point on Ocracoke. The untouched beach at Ocracoke’s South Point. 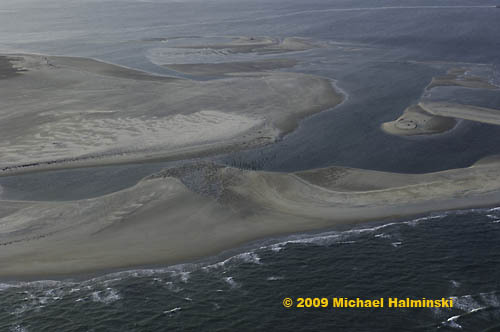 A sandbar where Ocracoke Inlet meets the Pamlico Sound. 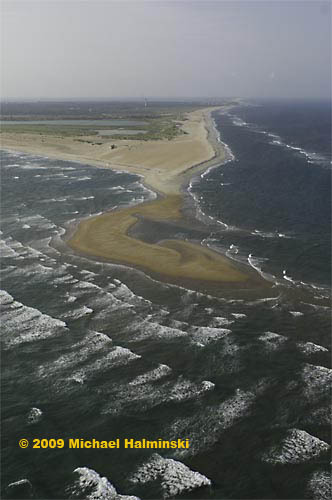 An underwater sand ridge extending into Pamlico Sound from Ocracoke Inlet. 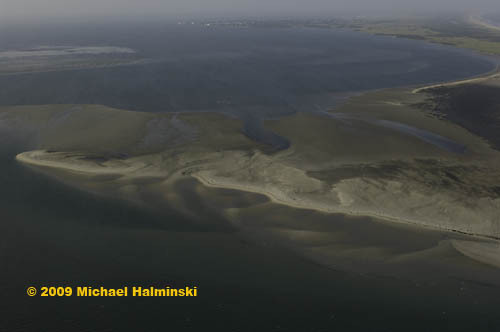 A sandbar in the Pamlico Sound near Ocracoke Inlet. 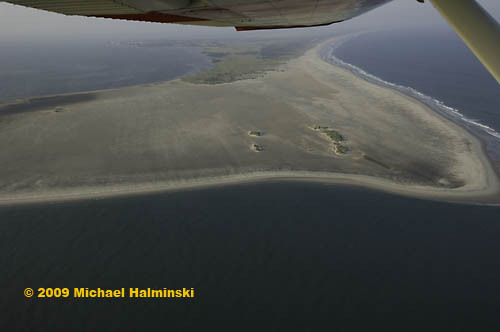 Dwight’s Cessna banking over Ocracoke Inlet for a shot at the untouched South Point. 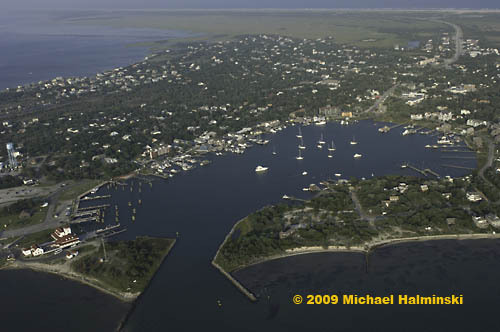 The South Point of Ocracoke in a pristine state from 1,000 feet. 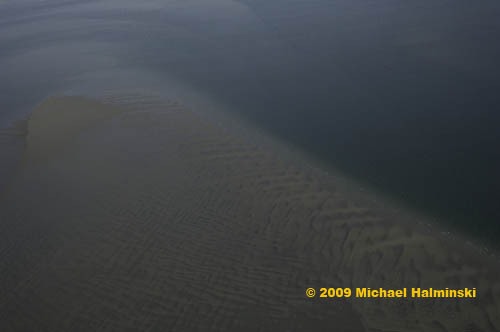 This entry was posted in aerial photography, beach, Ferry boats, inlets and sandbars, Outer Banks, Pamlico Sound, Sea on July 31, 2009 by j0jgvm89bj. I’ve been struggling with photography most of my adult life. Don’t get me wrong. Making photographs has brought me a lot of satisfaction, not to mention a livelihood. But working to get better at any skill requires repetition and, pardon the pun, focus. From the very beginning, my approach was to be personally involved in the entire process from visualization, clicking the shutter, and ultimately hand-developing the print. I wasn’t formally educated as a photographer, but instead chose to deal with it on my own terms… teaching myself, getting inspired, going out and shooting, making mistakes, reshooting, printing…. making mistakes, printing again. Take beachscapes for example. It’s a hit or miss. I can’t count the number of times that I’ve gone out in search of a great shot on the beach, only to be disappointed when editing later. Circumstances are never the same, never repeating. There are so many aspects in the equation…. the weather, the light, foreground and background, composition, not to mention the perspective that different lenses allow. It’s difficult, if not impossible to convey the reality that I feel, into a two-dimensional image. The scenery can be emotionally overwhelming. And all I can do is try to get as close as I can. It can’t be forced. It just has to happen. 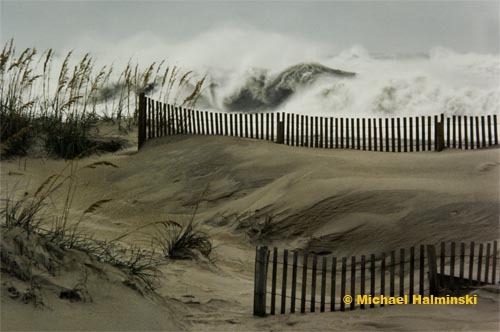 Dunes and Storm Surf is one of my favorite shots taken in 1982. I’ve frequently used this as a model for other attempts at stormy beachscapes, but I’ve never even come close to this kind of impact. Here I learned to compress the background wave energy into the foreground, using a small telephoto lens. In this case, it was a Nikkor 135mm lens and my preferred film, Kodachrome. 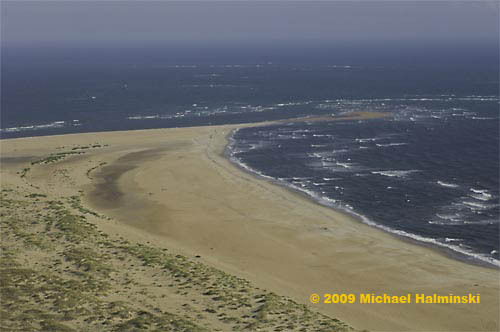 A second example of bringing the wave energy close to the viewer was shot from on top of a dune at the infamous “S-Curves” north of Rodanthe. This time, the wave was actually breaking close to the dunes, so I only needed my trusty, super sharp 55mm Micro-Nikkor to make this image. Again shot on Kodachrome, I have always loved the texture and color in the foreground. 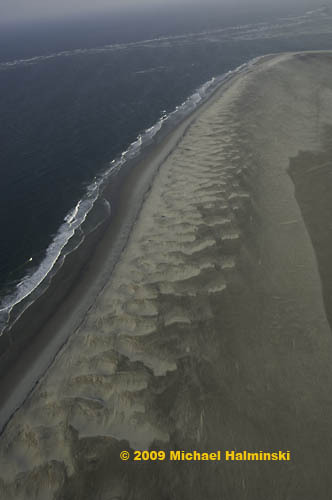 This image was made in 1984, when there was still a relatively natural dune line in place. It was only a few weeks later, I was shooting huge waves generated from Hurricane Josephine from this very same vantage point. Unbeknownst to me at the time, a big one struck the base of the dune, surged upward 15 feet and engulfed me and my Nikon F2 with sea water. The camera survived somehow, but the photomic meter and viewfinder had to be replaced. 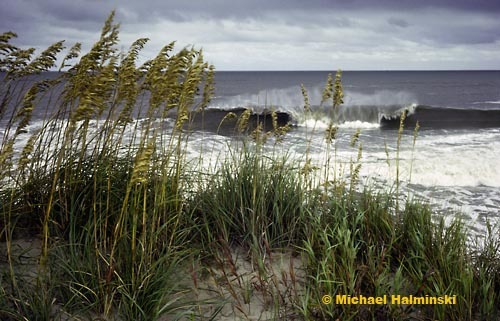 This image sold very well for me, and is called Sea Oats and Storm Surf . Most of my beachscapes are horizontally composed, but sometimes it’s good to rotate the camera 90 degrees for a vertical shot. Successful verticals can be very strong visually, so it’s always worth a try. 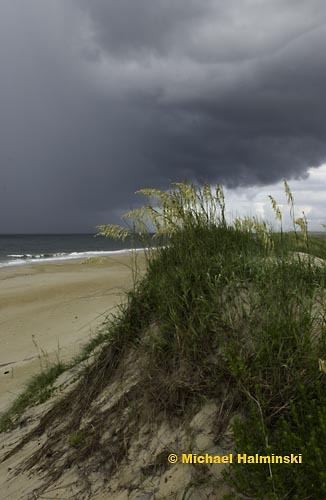 I call this image Sea Oats and Cold Front. It was taken in 1986 when I began to experiment with Fujichrome Velvia. I used a 28mm lens for this one. In 1991, Hurricane Bob was heading up the coast. 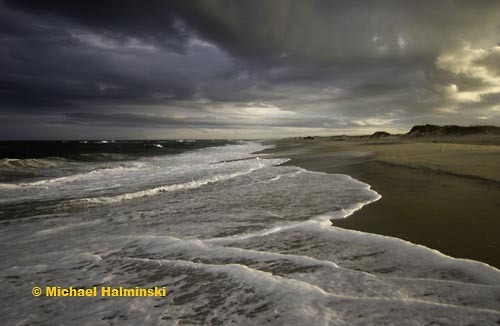 An evacuation was executed on Hatteras Island. As I recall, it was packing winds of nearly 120 mph, and I decided to ride this one out. As I drove north in the fleeing traffic to Pea Island, the sun was setting and the leading edge of the storm clouds was beginning to close in. The sky was spectacular. As I photographed this image, the cars on highway 12 were lined bumper to bumper trying to get off the island. The eye wall of Bob ended up passing us only about 15 miles offshore, and our winds gusted to 100. The folks in New England didn’t fare as well as we did. They got slammed. This one is called Before the Storm. It was taken using my 28mm Nikkor on an F3 body and Velvia film. October Beach is one of my more serene beachscapes. It was taken in 2004 with no film. I had entered the digital photography age in 2003. After trying to master image processing for 30 years, I had to re-teach myself the basics of imaging once again. On August 8 of 2005, I peered out of my studio to see some unusually interesting cloud formations moving in from the southeast. This is also a month when the tassels on the sea oats are fresh and new. Most of the out-take photos of this scene were shot as horizontals. However I remembered my rule of turning the camera to a vertical position, and liked what I saw. This is called Summer Squall. 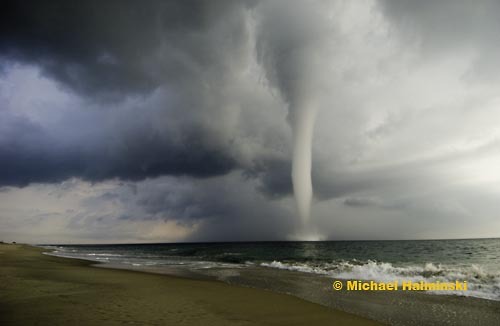 It always helps to have a waterspout offshore. On the morning of August 23 of 2005, I stepped out on the deck of my studio/home in Waves and saw a column of water reaching into the sky. 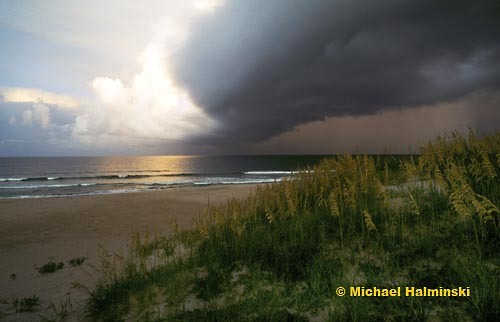 I’ve seen this before, but never in my many years living on Hatteras was it so well presented. For my photograph to be successful, the image has to satisfy me, nothing more. I’ve tried replicating some favorite shots, and it usually doesn’t seem to work as well as the original model. So I keep trying, and eventually something good happens. For many years in the darkroom, and now on a computer screen, I transfer that image to a print, still another “make or break” step in the process. If I didn’t make my own prints, I’d feel like I was short changing myself. I have to complete the entire process myself, in order to be the photographer that I am. This entry was posted in beach, Sea, Weather on July 11, 2009 by j0jgvm89bj.